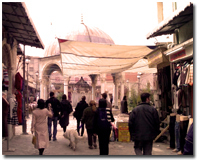 A bazaar is a permanent merchandising area, marketplace, or street of shops where goods and services are exchanged or sold. The word derives from the Persian word bāzār, the etymology of which goes back to the Pahlavi word baha-char meaning “the place of prices”. Although the current meaning of the word is believed to have originated in Persia, its use has spread and now has been accepted into the vernacular in countries around the world.